With over seven billion people on the planet and half of them on the internet, it can easy for a myth or an urban legend to proliferate around the globe in no time at all. No hobby or industry is safe when it comes to myths and misinformation, often started by someone who knows almost nothing about the subject at hand. Home hot tubs are no exception, so you won’t be surprised to know that there’s false information going around regarding both used and new hot tubs. Why are we talking about them today? 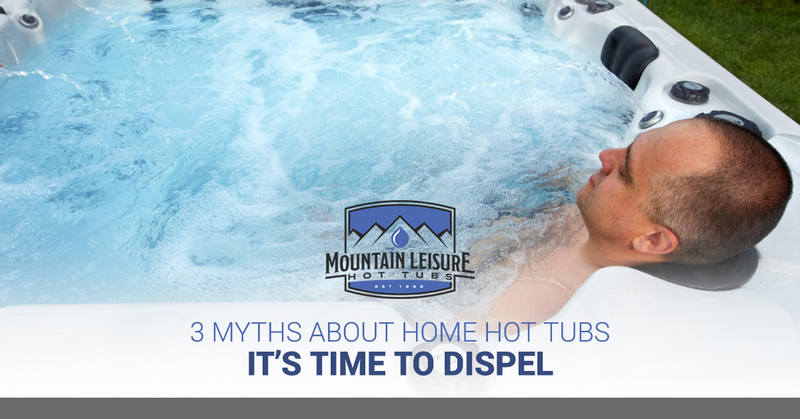 We want to make sure you have as much accurate information as possible when you’re considering purchasing a home hot tub. We don’t want you to be scared off from purchasing one because of a misconception. Let’s put some of these myths to rest. When you think about it, the idea of getting in a tub with other people is a bit strange. But it’s been part of the human experience for thousands of years, because it’s an excellent way to relax and socialize. If people had stopped this “ritual bathing” in hot tubs and use of swimming pools after we learned about the existence of germs, it wouldn’t have been surprising if we completely abandoned them both. But we didn’t. The draw to have fun, social interactions while relaxing in a body of water was just too great, so humanity came up with hygienic ways in which to do so. The fact is, the chemicals and filtration systems in home hot tubs have made them very sanitary places. That’s what they’re there for after all, and because the pumps are sending a relatively small amount of water through the filtration system constantly, you don’t have to worry about a hot tub being a “dirty” place. To keep your hot tub as clean as possible, check out our spa maintenance schedules. Some of us enjoy boating, others spend their disposable income on photography, and travel is first on the list of certain middle-class citizens of North Carolina. Few of us can go all out on all three, but we can all pick and choose what’s important for us that gives us some pleasure in this crazy world. The fact is, we all have to make choices with how we spend our money. But it’s important to consider what you’re getting back from the money you spend. Does purchasing a big hot tub and keeping it clean cost money? Yes. But think of the way it relaxes you, the way that it can take you away from a bad day. It can massage you, and the heat can make you feel good. And when you feel good, you can approach life with a confidence that could lead to even greater things. Just about anyone can afford a hot tub, especially if it’s a priority in their lives. Want to save a lot of money? Try a refurbished pre-owned hot tub that has been through our multi-point inspection and works as good as a new hot tub. It’s the same with hot tubs. While some hot tub companies might claim their 100 nozzles are better than another company’s 50, it’s not necessarily going to get you a better hot tub experience. The placement and power of the nozzles means so much more than the sheer number. Buying a top-rated hot tub here in North Carolina is more important than the sheer number of nozzles you’ll get in a cheap hot tub. Ready To Get Your Home Hot Tub? If you’re ready to purchase a new spa, whether it’s a new or refurbished pre-owned hot tub, we’d love to talk with you about your options. Click here to check out the hot tub brands and models we carry so that you can find the perfect configuration for your North Carolina home!